The image above is a view from the south looking north over the junction of the Intracoastal Waterway, Okeechobee Waterway to the west (left), St. Lucie River also to the west (left), and the St. Lucie Inlet to the right (east). Farther north, the Ernest Lyons Causeway Bridge is visible, as is Nettles Island at Jensen Beach. 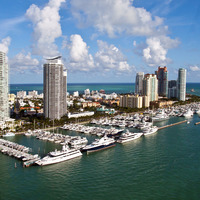 Often referred to as the Crossroads of the Intracoastal, the area north of the Great Pocket inlet is where four aforementioned waterways meet. Heading south, you can take the Okeechobee Waterway Route toward Stuart via the St. Lucie River. Great Pocket carries the Intracoastal Waterway route south. 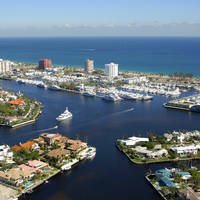 The St. Lucie inlet allows shallow-draft cruisers with local knowledge to pass offshore. There are many marinas and marine facilities located just west of Great Pocket in Manatee Pocket, about one mile to the west of red daybeacon 2, Mile 0 of the Okeechobee Waterway. 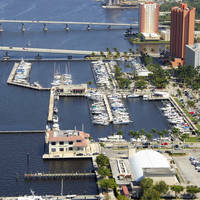 Farther north up the St. Lucie River is the city of Stuart with many marinas and facilities. On the Intracoastal Waterway, approaching from the north at green daybeacon 237, set a course of 163 degrees magnetic ton intercept flashing red 240, just north of Okeechobee Waterway Mile Marker 0. Once you have picked up the flashing red light, head south and pick up red daybeacon 2, and farther south into Great Pocket Inlet to intercept green daybeacon 1 and red daybeacon 2, visible above. Alternatively, from flashing red 240, you can head up into the St. Lucie River or out to the Atlantic Ocean via the St. Lucie Inlet. Great Pocket leads about three miles farther south before it empties into Peck Lake. No reviews yet! Be the first to write a review of Great Pocket North Inlet.